The world’s largest retailer will let shipments of food, household goods and health and beauty products arrive at regional distribution centers one day early, according to a memo from Chief Merchandising Officer Steve Bratspies obtained by Bloomberg News. Under rules instituted just last year, deliveries that came the day before they were due had been subject to fines, as they could create overstocks. Walmart’s more generous stance comes as suppliers such as General Mills Inc. and Hershey Co. grapple with a transportation shortage and new driving regulations that have sent shipping costs spiraling. Walmart handles the shipping for many of its suppliers through its own trucking fleet and other transport providers, and it rolled out the tighter delivery windows in August to reduce out-of-stock items and boost sales. 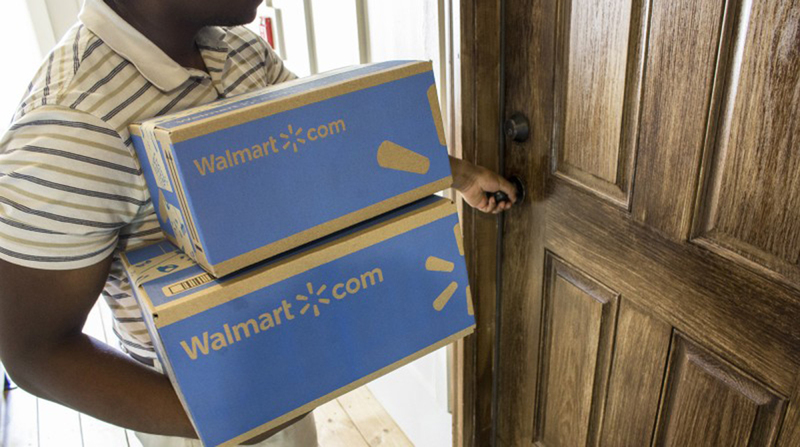 Now, with deliveries at risk of coming late to its 4,700 U.S. stores, Walmart is easing up. A Walmart spokesman said the company made the shift to simplify delivery requirements for suppliers who handle both food and slower-moving general merchandise products such as electronics, hardware and apparel. The new rules had narrowed the on-time window for food and consumables such as baby products and pet supplies to one day, compared with two days for general merchandise. Suppliers of food and sundries now have a “one-day early option,” according to the memo. Walmart said the early shipment option wasn’t related to the continuing trucker shortage, as it only applied to some of its distribution centers. Still, the capacity crunch is taking a toll. One consultant who works with small- and medium-size Walmart suppliers said trucks to pick up clients’ orders typically are arriving two or three days late, prompting a flurry of e-mails and conference calls among vendors and Walmart’s transportation and replenishment managers. When trucks do show up, there’s sometimes not enough space in the trailer for all the goods, said the consultant, who asked not to be identified as the discussions with Walmart are private. Walmart works with more than 100,000 suppliers, and the larger ones are better equipped to deal with transportation shortages, which affect all retailers and consumer-product companies. Walmart executives have said that higher prices to move goods weighed on its profit margins in the fourth quarter. And the problem has worsened in recent months as new federal regulations requiring most big rigs to record driver hours with electronic logging devices took effect. Surging demand and rough weather have also contributed to push trucking spot rates up 27% in the year through April 6, according to Truckstop.com. “It’s a perfect storm, and I think it will keep raging for a bit,” said Kevin Hill, founder of transportation data provider CarrierLists. With assistance by Thomas Black.